Brochure for Triplex shatterproof glass, which was standard equipment on Ford Model A windshields beginning in 1928. The automobile is a revolutionary technology. Increased personal mobility created new economic, social, and recreational opportunities and changed the American landscape. But the benefits of mobility were accompanied by dramatic new risks. Automobiles placed speed and power in the hands of individuals. In the early twentieth century, a soaring rate of traffic deaths and injuries prompted expressions of concern. A dialogue among physicians, safety advocates, engineers, journalists, and others revealed differing opinions about the causes of accidents, injuries, and fatalities. Driver behavior, automobile design, highway engineering, and traffic hazards all were blamed. Efforts to retain the benefits of personal mobility while minimizing its sometimes tragic consequences focused on specific problems from controlling driver behavior to redesigning automobiles to improving the driving environment. It took decades to understand, prioritize, and minimize these risk factors. In the 1910s, speeding, reckless driving, collisions, and pedestrian fatalities were new problems requiring new solutions. The first remedies comprised a social response focused on controlling and improving driver behavior. 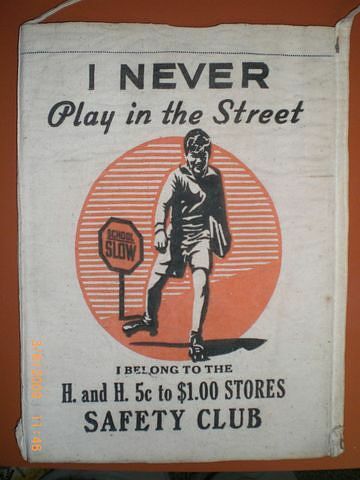 By the early 1920s, the National Safety Council compiled accident statistics, held conferences, and sponsored Safety Week campaigns in cities in the hope that increased public awareness would promote careful driving. Controlling driver behavior through laws, fines, signals, and drunk driving arrests were obvious ways to decrease the fatality rate. 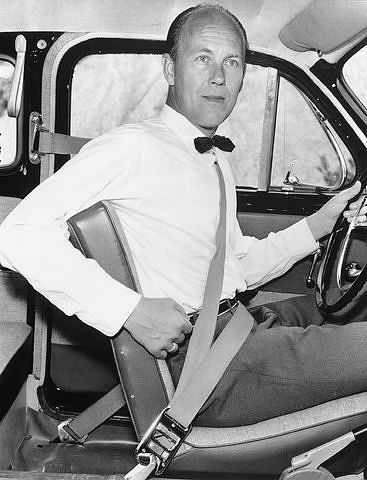 Safety engineer Nils Bohlin demonstrating his three-point seat belt, which was first installed in 1959 Volvo cars. Americans were slow to understand the importance of redesigning automobiles to make driving safer. At first, the automobile was perceived as a neutral device that merely responded to a driver’s commands and could not cause an accident. But by the late 1920s, manufacturers acknowledged that design flaws compromised safety. They introduced a technological response to safety issues, adding shatter-resistant windshields and four-wheel brakes instead of two-wheel brakes. In the 1930s, this approach evolved into a market response as auto makers actively promoted new safety improvements such as all-steel bodies and hydraulic brakes. Auto makers now assured motorists that modern cars were completely safe, and industry representatives contended that improving roads, licensing drivers, and regulating traffic was the key to preventing accidents. Seat belts, energy-absorbing steering columns, and padded dashboards were not installed, even though all of those devices had been invented by the 1930s. In the 1950s, physicians and university professors who were concerned about motorist protection introduced a scientific response to auto safety problems. Crash testing at universities pinpointed the causes and effects of bodily impact inside a car during a collision. These studies convinced many people that it was necessary to “package” the driver and passengers with seat belts and padded dashboards. By 1956, those features were available as options on most new cars. 1957 Chevrolet damaged by its occupants in a collision. The car was not equipped with seat belts. In the late 1950s, elected officials studied scientific findings from university crash tests. In the early 1960s, many state legislatures passed laws requiring seat belts or seat belt anchors in new cars. This movement grew into a comprehensive government response to auto safety issues. In 1966, Congress authorized the federal government to set safety standards for new cars. By 1968, seat belts, padded dashboards, and other safety features were mandatory equipment. 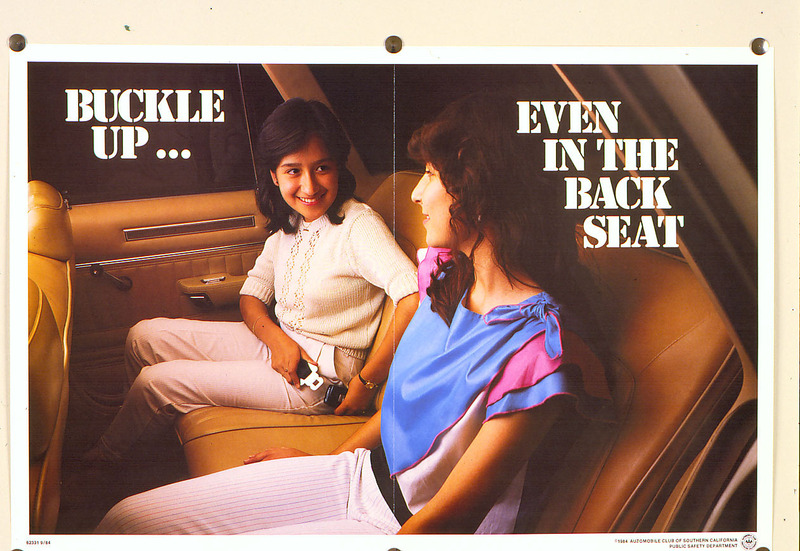 At first, most motorists didn't wear seat belts, but by the 1990s seat belts were widely accepted. Safety campaigns emphasized the importance of buckling up, and state laws made motorist compliance mandatory. By 1998 the federal government also required air bags as standard equipment. Forced technological change made the automobile itself the first line of defense in an accident. At the dawn of the twentieth century, mass-market automobiles brought the exhilarating promise of expanded personal mobility. But automobiles created new hazards; the power, weight, and speed of a car made it more likely to cause injuries and fatalities than a carriage or a bicycle. An alarming increase in deaths resulting from traffic accidents raised concerns in many sectors of society. Almost all observers of safety problems believed that driver competence and behavior determined whether the automobile would be a boon or a menace. Unlike a horse, which was capable of safely guiding a carriage or overturning it if frightened, an automobile depended entirely on the driver for direction and control. Logic dictated that an inanimate machine could not cause accidents; it merely responded to the driver's commands. Public safety seemed to depend on improving driver skill, increasing caution, and reducing rampant errors and recklessness. 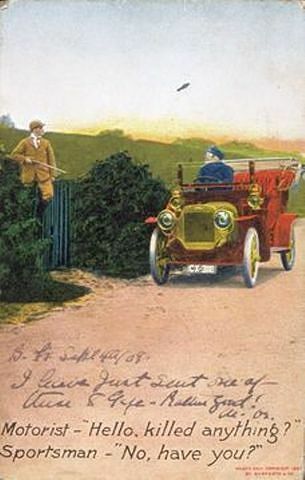 As automobile ownership became common in the 1910s and 1920s, a broader culture of safety advocacy emerged. Motorists were endangering each other and themselves in addition to pedestrians. The National Safety Council focused on the human factor in automobile accidents. Safety leagues in major cities conducted public awareness campaigns to make drivers and pedestrians pay more attention in traffic. The federal government encouraged state and local governments to improve and standardize traffic engineering, laws, and law enforcement. The auto industry searched for specific causes of fatalities by compiling accident reports while insisting that automobiles themselves did not contribute to accidents if driven properly. Shoulder bag issued by a store in Luray, Virginia to promote pedestrian safety among children. 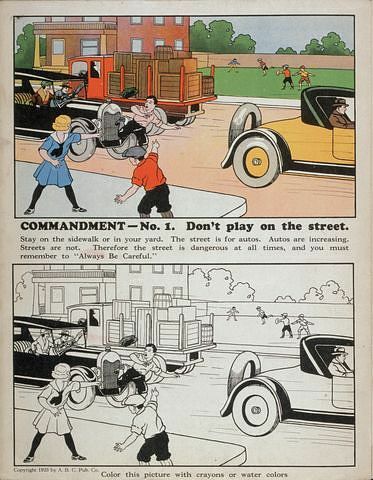 Children playing in the streets were especially vulnerable to growing automobile traffic. Safety experts concluded that driver behavior and the driving environment were responsible for accidents. They argued that external control systems were needed. Roads should be engineered for safety; drivers should obey rules, signs, and signals; intoxication from alcohol should not be permitted; and law enforcement was needed. Careful planning would bring order out of chaos and create an environment suited to automobiles instead of horses and carriages. 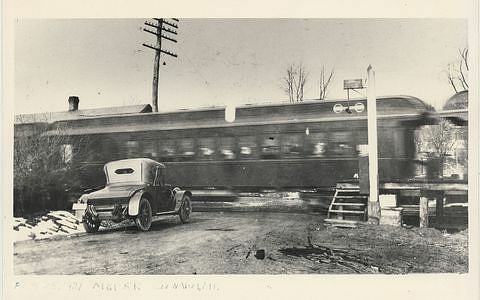 The number of automobiles and trains increased significantly in the early twentieth century, and so did collisions at railroad grade crossings. Many drivers did not stop or even slow down at crossings. Automobiles presented a more serious problem than horse-drawn vehicles because of their greater weight and speed; collisions endangered not only motorists but trains and their passengers. 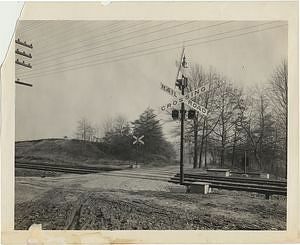 Railroad companies placed warning signs on roads leading up to grade crossings and installed bells at the tracks. But many drivers ignored the signs, and automobile engine noise drowned out the sounds of bells and trains. 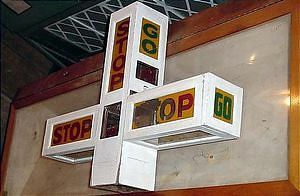 In 1921, Charles Adler, Jr., a Baltimore inventor who devoted his career to improving road, railroad, and aircraft safety, designed and installed a train-actuated crossing signal that turned a double STOP sign toward motorists when a train was approaching. The movement of the sign provided a visible warning that driving conditions had changed. Railroads then tried flashing lights to get drivers' attention. In 1922, the Association of American Railroads standardized crossing signals, adopting as a uniform design a pair of alternating flashing red lights that were actuated when a train was approaching. 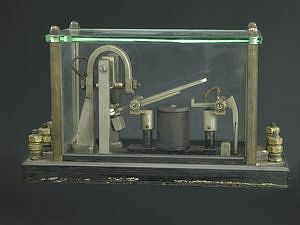 Charles Adler, Jr. patented an electrical relay that created an alternating or wig-wag light pattern. Manufactured by SACO (Signal Accessories Corporation), the Adler Alternate Flashing Relay was used by more than 40 railroads in the 1920s and 1930s. Increased automobile traffic also brought a need for more effective traffic control devices and systems on city streets. Hand-operated semaphore signals at intersections were replaced by electrically lighted signals beginning in 1912. Automated signals were introduced by 1914, interconnected traffic signals by 1917, and four-way signals by 1920. Refinements to traffic signals helped to control driver behavior and reduce accidents and fatalities. In 1923, Garrett Morgan, an African American inventor in Cleveland, Ohio, patented a signal that stopped vehicles in both directions before changing the direction of traffic flow. This brief pause reduced the possibility of a collision caused by a vehicle continuing in motion after the STOP signal was displayed. 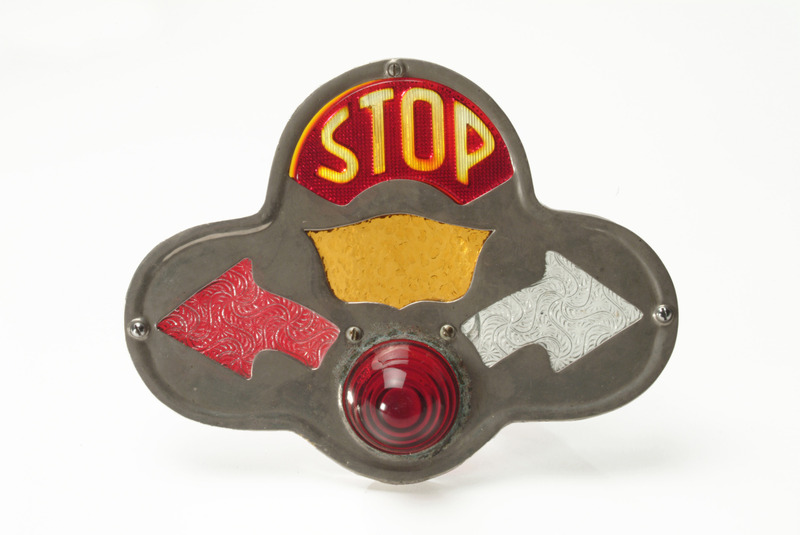 The safety interval was standardized in a different traffic signal that superseded Morgan's design: the three-position signal with red, amber and green lenses. Some inventors thought that signals mounted on automobiles would help prevent accidents by improving communication among drivers. Several individuals patented tail-mounted turn signals that indicated an impending left turn or right turn. Jonathan Cass Stimson invented a reflector that revealed the outline of a vehicle in the dark. Stimson's "central triple reflector" had angled, cube-shaped cells that reflected headlight rays back to their source regardless of direction. Some inventions provided information about position and speed. Charles Adler, Jr. developed the Spaceometer, a gauge that showed how many car lengths should be maintained ahead of a car at various speeds. 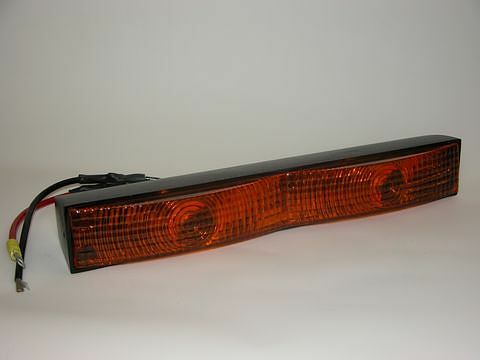 John Voevodsky invented the Cyberlite, a rear-mounted flashing light that showed how rapidly the car ahead was decelerating. 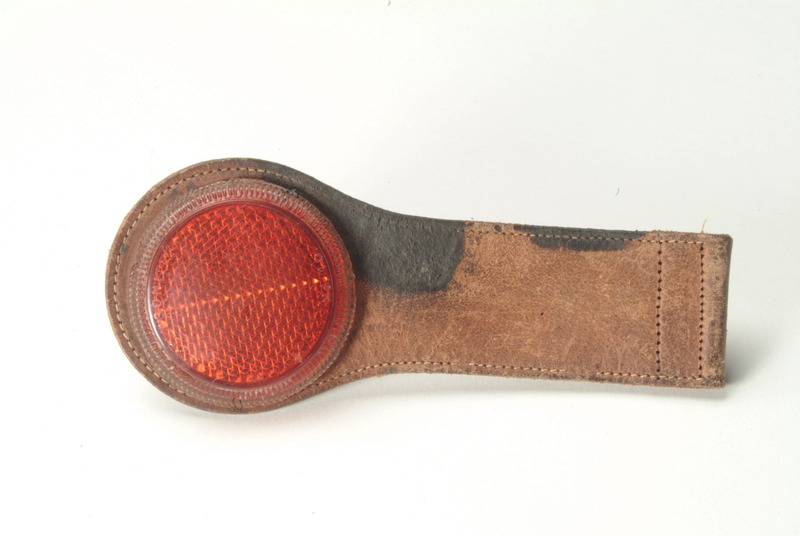 Thousands of Cyberlites were sold as accessories, but the Center High Mounted Stop Light, a steady light, became standard. 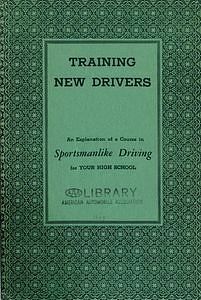 In the early twentieth century, new drivers were taught by family members, friends, or car dealers. By the 1930s, some safety advocates thought that formal training of young motorists in public school systems would reduce accidents. In 1932, Amos Neyhart, an industrial engineering professor at Pennsylvania State University, established driver education courses at State College High School, located near the Penn State campus in State College, Pennsylvania. Neyhart served as an advisor to the American Automobile Association (AAA), which developed curricula for driver education students and teachers under the title Sportsmanlike Driving. AAA encouraged the development of driving classes at public high schools and established training programs for driving instructors at colleges and universities. A growing number of high schools added special courses in an effort to improve driver skill and behavior and reduce the number of accidents. In many high schools, there were not enough teachers for one-on-one experience behind the wheel of a car. Driving simulators filled this gap by the 1950s. 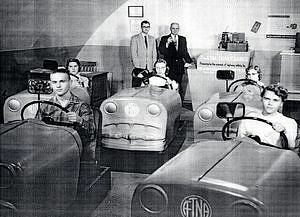 Developed by an insurance company in the early 1950s, the Aetna Drivotrainer simulated driving experience at less cost than on-the-road training. High school students watched real-time traffic films while "driving" consoles with actual Ford automobile parts, including a steering wheel, brake, accelerator, and speedometer. An instructor monitored students' reactions on a central console. Until the 1930s, a driver detained on suspicion of intoxication underwent police evaluation of his or her speech, eyes, gait, odor, color, and behavior to determine whether excessive amounts of alcohol had been consumed. Blood samples sometimes were drawn, but that was an intrusive process. Physicians searched for a quick, easy, accurate way to measure blood alcohol levels. Dr. Rolla N. Harger, a chemistry professor at Indiana University School of Medicine, constructed a blood alcohol measuring device that used a breath sample blown into a balloon. In 1936, Harger received a patent for the device, which he named the Drunkometer. In 1939, Indiana passed the first state law defining intoxication in terms of blood alcohol percentage. Indiana State Police routinely used the Drunkometer, and other states soon adopted it. 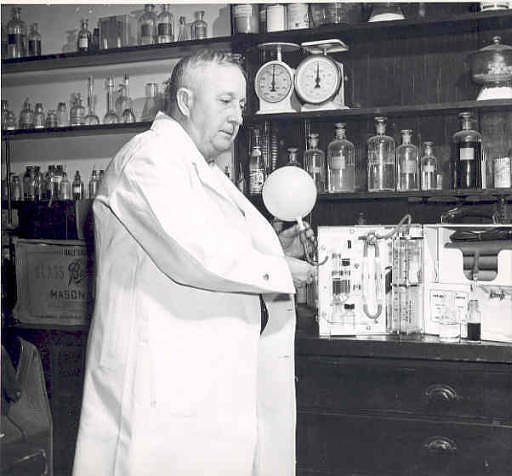 In the early 1950s, Robert F. Borkenstein, an Indiana State Police officer, developed the Breathalyzer. Small and portable, the Breathalyzer was easier to operate than the Drunkometer and provided faster, more reliable results. Public concern about driving while intoxicated took many forms. 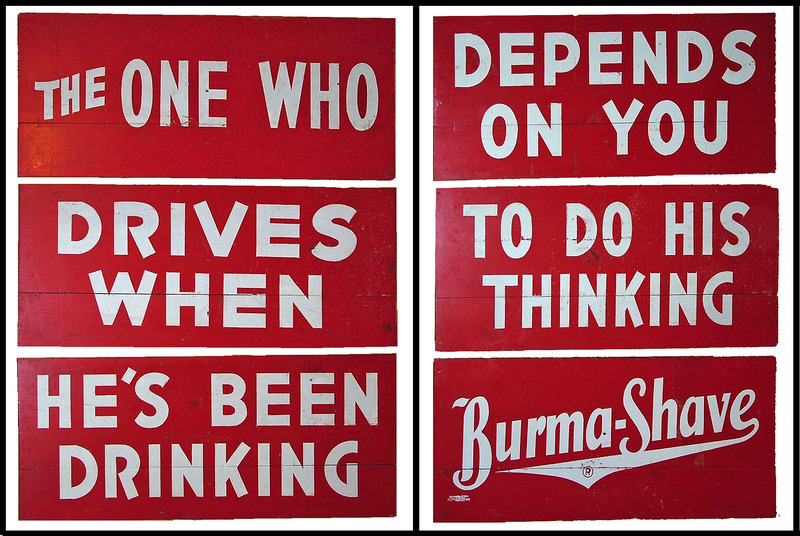 Roadside signs advertising Burma-Shave often dealt with social issues, including the burdens that intoxicated drivers place on society. The rhymes, wry humor, and serial format attracted widespread attention. Some signs offered dark, humorous reminders to drive carefully or suffer the consequences. The first "public service" Burma-Shave rhymes appeared in 1935. "We'd grown to be a part of the roadside," company president Leonard Odell explained, "and had a duty to do what we could about the mounting accident rate." Founded in 1980 by Candace Lightner, the mother of a 13-year-old drunk-driving victim in California, Mothers Against Drunk Drivers (later renamed Mothers Against Drunk Driving) successfully lobbied for a Presidential Commission on Drunk and Drugged Driving (1982), the National Minimum Drinking Age Act (1984), and a 2000 law that lowered the threshhold of intoxication to .08% blood alcohol content. The combination of MADD campaigns, drunk driving laws, police enforcement, and public information campaigns resulted in a significant decrease in alcohol-related traffic accidents and fatalities. MADD began Project Red Ribbon in 1986 to raise public awareness of the dangers of driving while intoxicated. Tying a MADD red ribbon onto a car door handle, outside mirror, or antenna became a symbol of citizen demand for safe driving free of impairment from alcohol. The campaign's title later was changed to "Tie One On for Safety," a defiant twist on the colloquial phrase "tie one on," meaning the act of having a drink. Local MADD chapters distributed red ribbons during holiday seasons and at other times to promote their cause. MADD also started local chapters, supported legislation at the state level, helped to establish the constitutionality of sobriety checkpoints, and supported the use of ignition interlock breath analyzers. In the late 1980s, some courts began ordering persons convicted of drunk driving to use an ignition interlock breath analyzer, a device that prevented a car from starting unless the driver passed a breath alcohol test. A green light on the device indicated that blood alcohol content was below the legal limit, and the car would start. A yellow light indicated that the driver was approaching the legal limit. A red light indicated that the driver was intoxicated, and the car would not start. 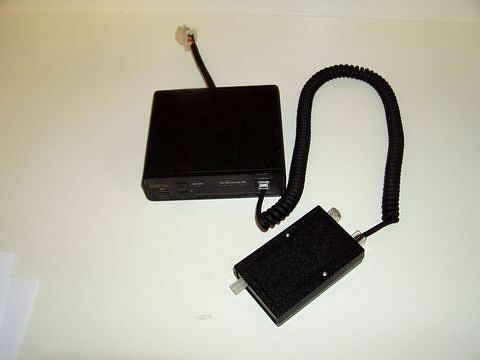 Guardian ignition interlock breath analyzer, about 1987. Guardian Interlock pioneered the production of breath alcohol ignition interlock devices and facilitated the integration of the devices with judicial systems. 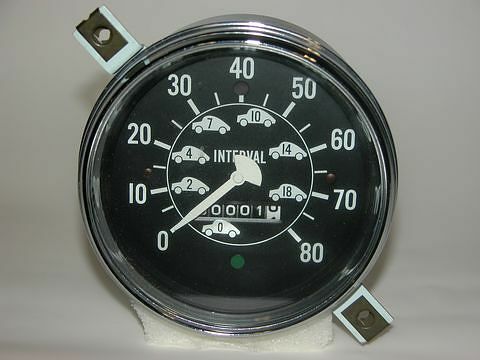 In the 1980s and 1990s, a growing number of state legislatures and state motor vehicle departments approved the device for widespread use. Over a 20-year period, Guardian Interlock refined its models from pass/fail operation to downloaded printouts to specification of blood alcohol content by percentage. Ignition interlock devices have been proven effective at reducing repeat offenses and saving lives. In the late 1920s, automobile manufacturers became aware that mechanical and body designs contributed to accidents, injuries, and fatalities. Many car makers began installing four-wheel brakes instead of rear brakes alone. 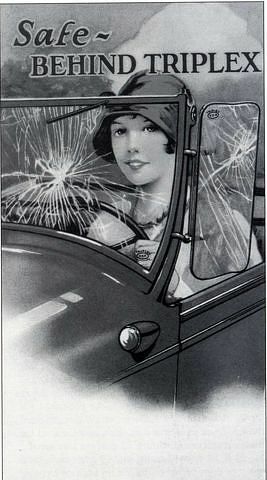 Some introduced shatterproof windshields so that glass would not break into sharp pieces in a collision. 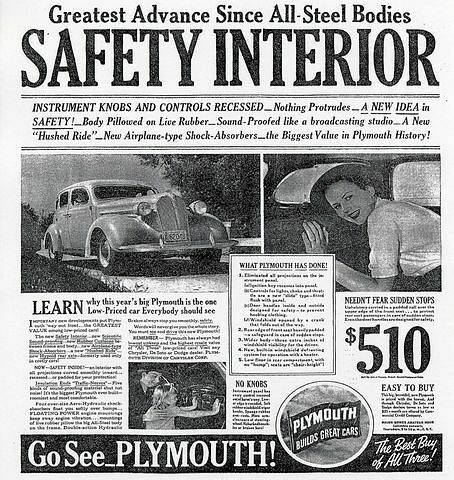 By the mid-1930s, media attention focused on the horrific consequences of traffic accidents prompted auto manufacturers to take a proactive role in promoting safety. Ads, articles, and sales brochures assured buyers that modern cars, which now had hydraulic brakes and all-steel bodies, were completely safe. But advanced forms of motorist protection such as seat belts and padded dashboards were not added, even though they were available. 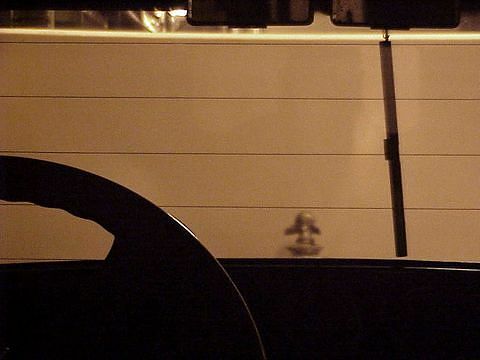 Manufacturers argued that accidents could be prevented if government would adopt strict driver regulations and improve the driving environment. 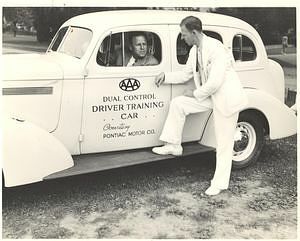 In 1937 the industry established the Automotive Safety Foundation, which awarded grants for safety programs and advocated tax-funded driver education and examinations, law enforcement, suspension or revocation of drivers' licenses held by offenders, traffic engineering, traffic studies, and the construction of high-speed, limited-access highways. Early cars had plate glass windshields and windows. In a collision, the glass broke into sharp, dagger-like pieces that could injure or kill motorists. In 1926, Stutz embedded horizontal wires in its windshields to minimize shattering. Another safety feature of the 1926 Stutz was its low center of gravity, which reduced sway and rollover. Heavy steel runningboards were designed to provide side-impact protection. 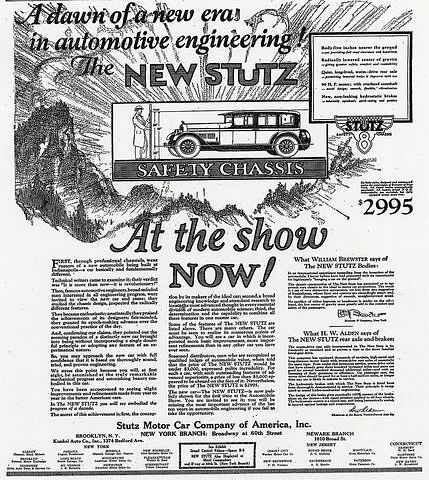 The company advertised the Safety Stutz, but at $2,995 it was too expensive for most Americans. 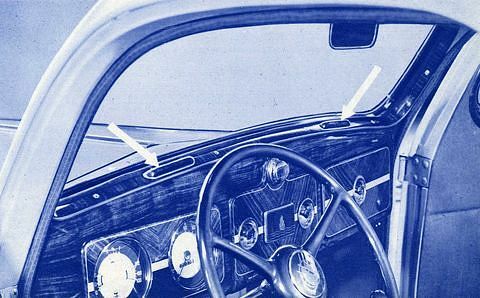 A more effective solution to the problem of shattered windshields was a "sandwich" of glass and celluloid that held fragments together on impact. Triplex glass was standard equipment on the 1928 Ford Model A windshield and attracted attention because it was mass-marketed on a low-priced car. General Motors installed shatterproof Duplate windshield glass on 1930 Cadillac cars. Like Triplex, Duplate consisted of two sheets of glass with an intermediate layer of celluloid. Duplate was made by the Pittsburgh Safety Glass Company, which was owned by Pittsburgh Plate Glass and DuPont. The automobile industry contended that driver education, better traffic controls, and more law enforcement would prevent accidents. However, new car marketing emphasized horsepower and speed. Some industry officials insisted that powerful engines enhanced safety because motorists could escape dangerous situations quickly. But safety advocates questioned drivers’ ability to handle automobiles at higher speeds. The horsepower race remained a feature of new car marketing through the 1960s. The automobile industry also advocated public funding of high-speed, dual lane highways with limited access and grade-separated crossings. In the 1930s, the industry-sponsored Automotive Safety Foundation called for 100,000 miles of superhighways at an estimated cost to taxpayers of $50 billion. 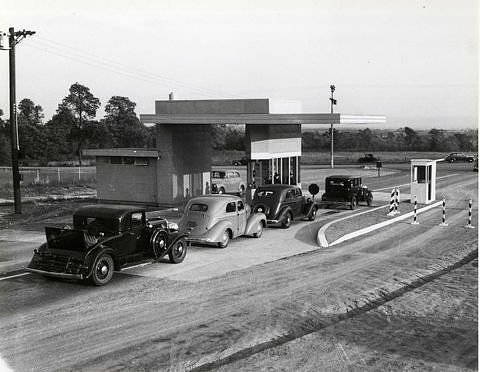 Opening the first high-speed turnpikes and freeways in the 1940s made headlines and prompted some journalists to remark that highway engineering had caught up with fast, "perfectly designed" automobiles. By the 1930s, automobile manufacturers had learned that modern styling attracted new car buyers more than mechanical performance. Streamlined bodies made cars appear to be the cutting edge of machine-age technology and symbols of modernity and speed. Annual model changes and art deco embellishments excited car shoppers with the prospect of owning the newest fashions in mechanical beauty and the latest gadgets. But streamlining often conflicted with safety. Oval windows and wide roof pillars reduced visibility from the driver's seat. Knobs and ornamentation on steel dashboards caused facial injuries in collisions. And far from being aerodynamic, cars of the 1930s swayed at high speed. As long as manufacturers remained focused on marketing, they emphasized cosmetic improvements to car bodies because that boosted sales. Safety enhancements, though sometimes mentioned in sales literature, typically took a back seat; auto makers preferred the sizzle of style and novelty. In the 1930s, the continuing high rate of automobile-related fatalities prompted safety advocates to seek explanations other than driver error. Physicians, inventors, and journalists noted that in an accident the driver and passengers always collided with the metal dashboard, steering wheel, windshield, or doors, resulting in serious or even fatal injuries. 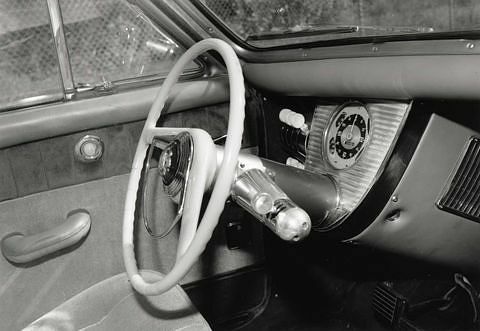 Dashboard knobs, door handles, radio grilles, steering columns, and other fixtures were knife-like projections that could impale or lacerate motorists. 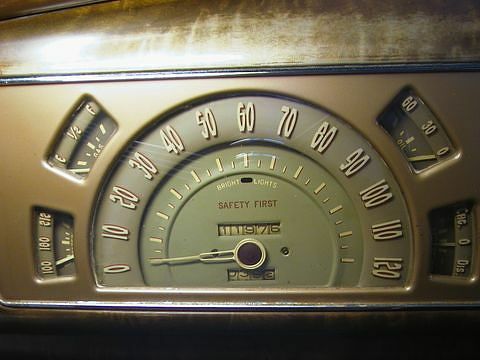 This 1936 Cadillac, like most cars of the 1930s, had a steel dashboard studded with knobs. In the 1930s, Dr. Claire L. Straith, a Detroit plastic surgeon who specialized in reconstructing the faces and skulls of automobile accident victims, began a one-man campaign to eliminate injuries caused by steel dashboards, protruding knobs, hook-shaped door handles, and other interior hazards. He installed lap belts in his own cars, and he designed and patented a dashboard crash pad. Dr. Straith became nationally known for his one-man safety campaign; his ideas were published in the Journal of the American Medical Association, and he was often cited in newspapers. At Dr. Claire L. Straith’s recommendation, knobs in the 1937 Plymouth were recessed and could not cause puncture wounds in an accident. But the safety improvements were short-lived; protruding knobs returned in subsequent years. Dr. Straith wrote a persuasive letter to Walter P. Chrysler, and Chrysler Corporation redesigned its interiors with safety in mind. 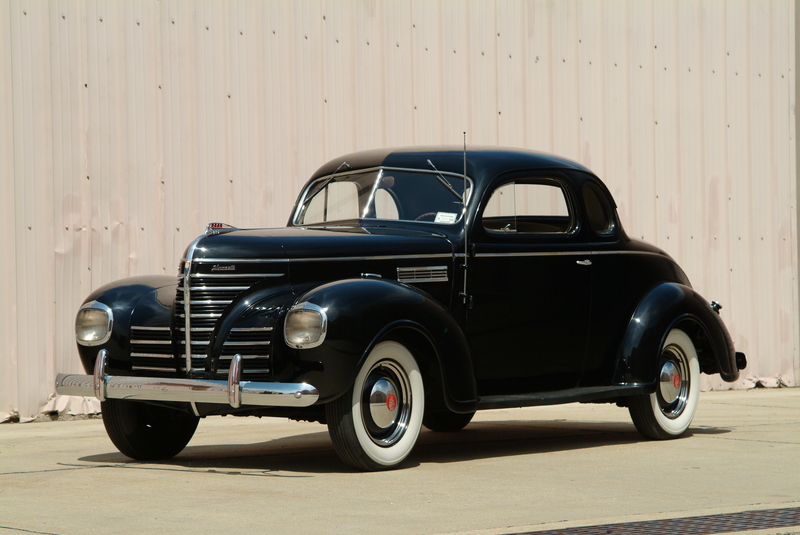 The 1937 Chrysler, Plymouth, Dodge, DeSoto, and Imperial cars didn't have seat belts and padded dashboards, but they had recessed knobs, rubber buttons, curving door handles that could not snag motorists, and padded seat tops. 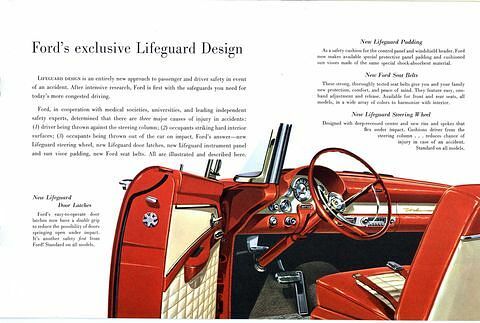 This was the first time that an automobile manufacturer promoted streamlined design for safety instead of styling. In 1948, Preston Tucker, a former race car builder and defense manufacturer, introduced a “totally new” car and emphasized its novel safety features. 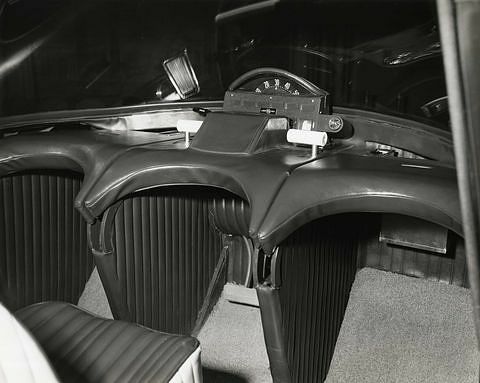 Tucker built 51 cars with interior door buttons that couldn't snag clothing, knobs clustered away from motorists, dashboard padding, and an area under the dashboard where the front passenger could crouch in the event of a collision. 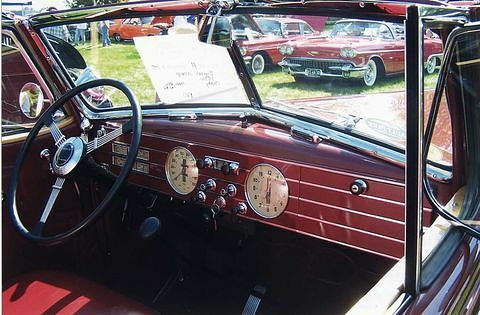 Other safety features included a pop-out windshield that yielded on impact, a center headlight that turned with the steering wheel, and a rear-view mirror made of shatterproof, silver-plated plexiglass. Tucker considered installing seat belts in his cars but rejected the idea. 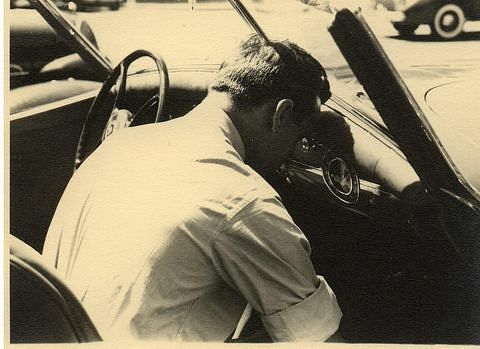 Philip Egan, one of the car’s designers, recalled that Tucker “felt that they would imply something inherently unsafe about the car…too vigorous, too fast for anyone’s good.” Car production stopped following a federal investigation of Tucker’s business practices, but some of his safety ideas appeared on mass-market cars in the 1950s. In the 1930s, several inventors received patents for steering columns that collapsed on impact, sparing the driver from being impaled in a crash. Their concepts incorporated various designs that used a spring, scissors mechanism, or a hydraulic piston. 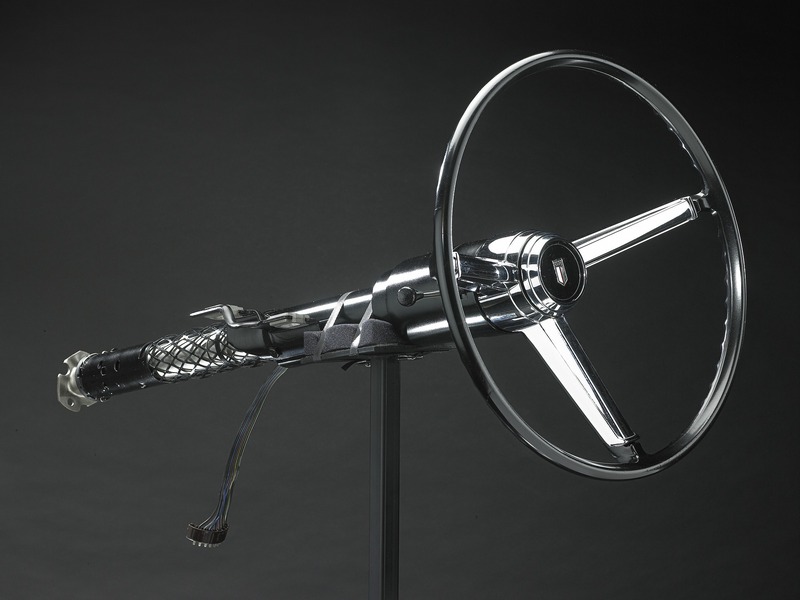 In 1959, General Motors began developing the Invertube, a steering column that turned inside out when force was applied. This design did not enter production, but in 1967 GM began installing steering columns with mesh that compacted under pressure. Chrysler adopted a similar column in 1967, and Ford introduced its collapsible design in 1968. General Motors ad for its energy-absorbing steering column, 1967. 1956 Ford advertisement highlighting a dish-shaped steering wheel, clustered knobs, stronger door latches, and optional lap belts, padded dashboard and shatter-resistant rear view mirror. By the 1950s, it was clear that automobile accidents were inevitable despite improvements in car design, driver education, highways, and law enforcement. The quest to minimize injuries and fatalities occupied the attention of physicians and biomechanics specialists at universities. Cornell, UCLA, Wayne State, and other universities conducted crash tests to pinpoint the causes and effects of bodily impact inside a car. An important recommendation emerged from these programs: seat belts, padded dashboards, and stronger door latches were urgently needed. Crash tests proved that it was safer to be fastened inside a car than thrown out during a collision. Packaging the passenger became a revolutionary new concept. 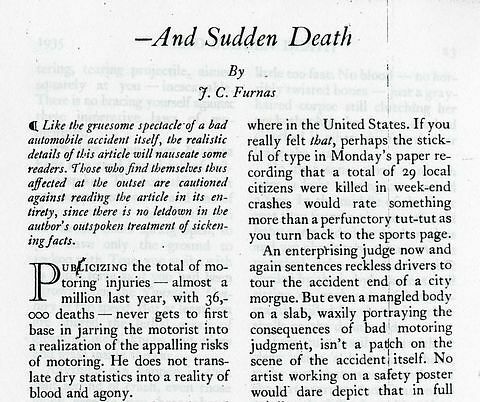 Newspaper and magazine articles about crash tests and seat belts stirred public interest. 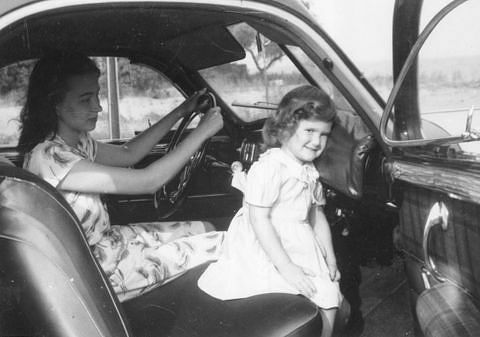 A 1955 Gallup poll showed that Americans approved of seat belts by a margin of 50% to 38%. Automobile manufacturers experimented with optional seat belts and padded dashboards in the mid-1950s. In 1942, Cornell University began studying pilot impact injuries inside airplane cockpits. By 1951, this program included the Automotive Crash Injury Research (ACIR) project. Cornell University's Medical College conducted automobile crash tests with dummies and studied accident survival in relation to door security, rollover hazards, and bodily impact inside a car. The ACIR staff recommended the addition of seat belts, dashboard padding, crashworthy door locks, and recessed-hub steering wheels to production cars. In 1957, Cornell Aeronautical Laboratory built a radically redesigned safety car for a public tour sponsored by Liberty Mutual Insurance Company, a contributor to the ACIR project. The Cornell-Liberty Survival Car featured seat belts, bucket seats, crash padding, sliding doors, side impact protection, and steering levers. A counterpoint to futuristic “dream cars” that appealed to emotion and imagination, the Cornell-Liberty Survival Car embodied sobering, practical designs that promised to save lives. 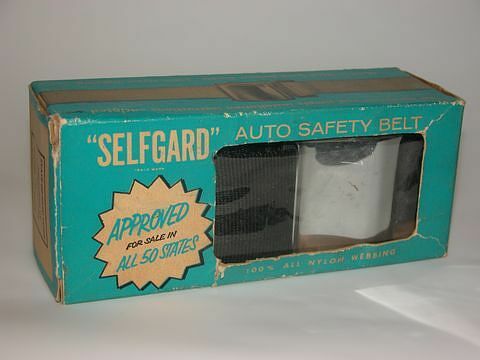 Padding and seat belts became standard equipment on production cars in the 1960s. 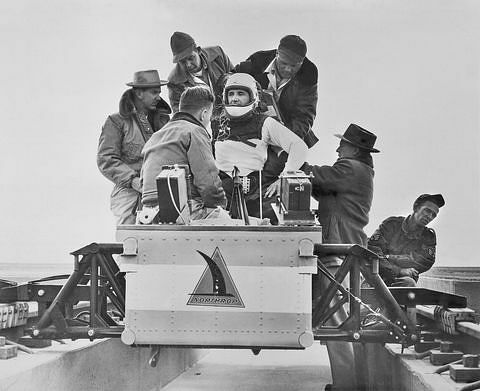 In the late 1940s and early 1950s, Lt. Col. John Paul Stapp, an Air Force physician, put seat belts in the news by strapping himself to a rocket-powered sled on rails. Stapp wore a harness while being subjected to rapid acceleration and sudden deceleration. He proved that a person restrained by belts could withstand forces of more than 46G and sudden stops at speeds of 632 mph or more with only minor injuries. These experiments were aimed at devising the best forms of pilot protection during ejection from supersonic aircraft. In the 1950s, Stapp turned his attention to automobile collisions. He conducted crash tests at Holloman Air Force Base in New Mexico and studied fatalities in Air Force vehicles. Stapp became a leading advocate of seat belts for motorists and testified before a House subcommittee on auto safety. In 1955, Stapp participated in a Car Crash Conference at Holloman Air Force Base under the auspices of the Society of Automotive Engineers. Later named in honor of Stapp, the conference became an annual event under the auspices of the Stapp Association. 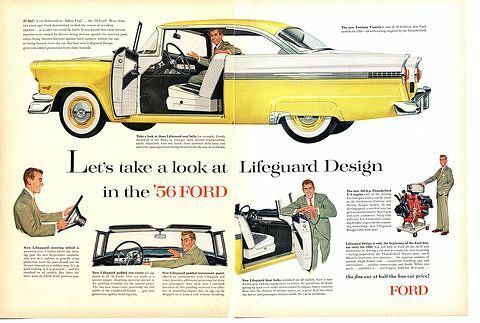 Ford launched a major advertising campaign for its Lifeguard Design package on 1956 Ford and Mercury cars. 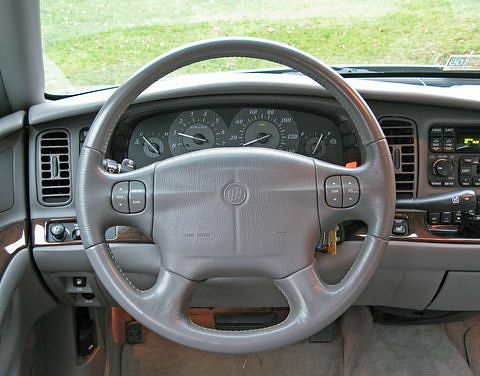 A dish-shaped steering wheel, clustered knobs and instruments, and stronger door latches were standard equipment. At additional cost, motorists could order lap belts, a padded dashboard, padded sun visors, and a shatter-resistant rear view mirror. Sales were brisk at first but soon were outpaced by the 1956 Chevrolet, which sported new styling and optional lap belts, shoulder harnesses, and padded dashboard. Robert McNamara, general manager of the Ford Division, believed that manufacturers had a moral obligation to study safety issues, develop protective safety hardware, and educate consumers. He also thought that life protection could sell cars. The National Safety Forum, a two-day conference in 1955 with crash tests and announcements of new safety features on the 1956 cars, was Ford’s attempt to raise the profile of auto safety research and intrigue the public. Few car buyers took advantage of optional seat belts and padded dashboards available from automobile manufacturers in the late 1950s. Some motorists knew the benefits of strapping themselves into their cars, but few actually purchased and wore seat belts. Some motorists didn't want to be trapped inside their cars, and others didn't want a visible reminder that an accident could happen while they were driving. Seat belts implied to some drivers that the car was unsafe or their competence was being questioned. In the 1960s, government authorities chose a policy of forced technological change to make cars safer. In 1961, Wisconsin became the first government authority to require seat belts in new cars. Some states required floor anchors to make it easier for car owners to install their own seat belts. By 1963, all new cars had floor anchors, and two more states -- Virginia and Mississippi -- required seat belts. 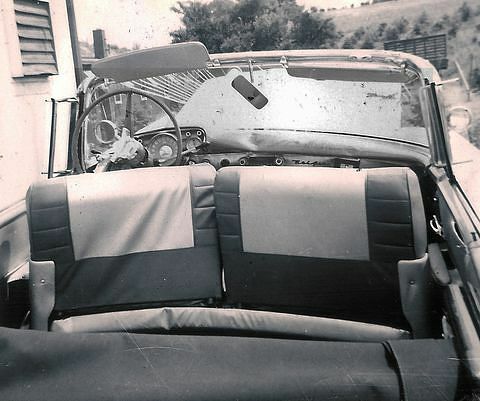 Legislation passed by Congress in 1964 required manufacturer-installed anchors, padded dashboards, and other safety equipment in cars purchased by the federal government. 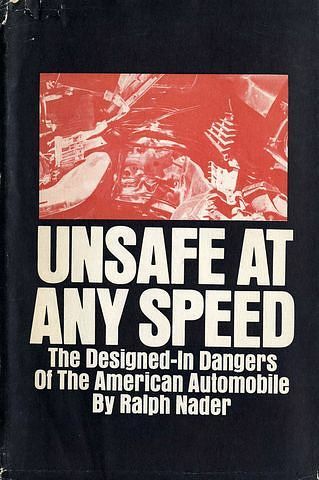 In 1966, Ralph Nader shocked the American people into a new awareness of the need for safer cars through his testimony in Senate hearings on auto safety and his widely read book, Unsafe at Any Speed: The Designed-in Dangers of the American Automobile. Later that year, Congress passed the National Traffic and Motor Vehicle Safety Act. This landmark legislation led to mandatory lap and shoulder belts and other lifesaving hardware in all new cars by 1968. 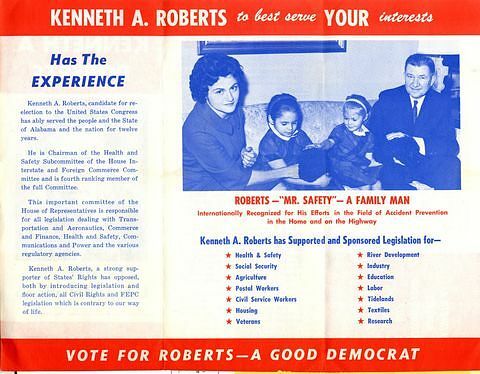 In the late 1950s, Rep. Kenneth A. Roberts, a nationally known consumer safety advocate, chaired a House subcommittee that investigated automobile safety issues. His field research and unequivocal demands for better motorist protection were widely reported in newspapers. Roberts blamed automobile design for injuries and fatalities. In order to overcome industry resistance to mandatory safety devices, Roberts sponsored legislation requiring safety equipment in all automobiles purchased by the federal government. This legislation passed in 1964. Roberts’ interest in motorist protection had been sparked by a personal experience. During a honeymoon trip in 1953, Roberts slowed for a truck, and his car was rear-ended. When he checked the badly dented trunk, he was surprised to learn that wedding gifts made of china and crystal were unbroken because his mother-in-law had padded and wrapped each item. He was among the first government officials who became convinced that packaging the passenger with seat belts and other devices was the key to reducing automobile-related injuries and fatalities. Several authors and consumer advocates advocated tougher auto safety standards in the 1960s. No individual is more closely identified with this movement than Ralph Nader. His 1965 book Unsafe at Any Speed galvanized public interest by portraying motorists as victims of corporate neglect. Nader accused the automobile industry of ignoring safety research findings, retaining hazardous designs that caused injury or death, and valuing sales and marketing above motorist protection. In 1966, Nader testified before a Senate subcommittee during the preparation of landmark federal legislation imposing safety standards on new cars. His testimony helped to focus the nation's attention on auto safety issues. Nader's quest for safer cars went beyond the installation of seat belts and padded dashboards. 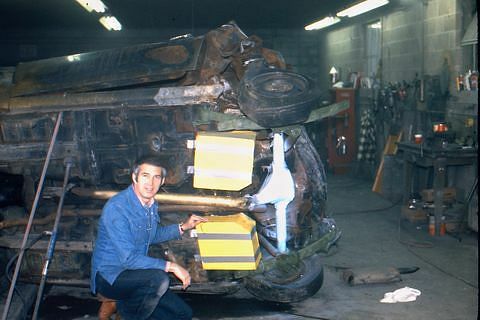 He called attention to structural and mechanical design flaws, devoting a chapter of Unsafe at Any Speed to Corvair's swing-axle independent rear suspension system. In 1970, Nader co-founded the Center for Auto Safety, which advocates recalls, lemon laws, and other measures that protect motorists and hold manufacturers accountable for hazards and defects. Nader also became an outspoken advocate of consumer protection in many other areas, including the environment, health care, and nuclear energy. Since the 1960s, safety expert Byron Bloch has exposed dangerous automobile designs and has recommended safer designs through courtroom testimony, government depositions, investigative reporting, journal articles, and lectures. Trained in industrial design and human factors engineering (the interaction between people and machines), Bloch has documented fuel tank fires, crushed roofs, and other hazards caused by vulnerable parts that fail during collisions or rollovers. He has advocated tougher federal standards and designs that promise to reduce the number of injuries, disabilities, and fatalities. In the 1960s, Ralph Nader encouraged Bloch to serve as an expert witness in product liability lawsuits involving motorists who were burned in collisions. Bloch's testimony about the dangers of rear-mounted fuel tanks made headlines. He also testified at a 1973 congressional hearing that led to rear-impact crash tests for fuel tank integrity. In 1978, Bloch collaborated with ABC News on an Emmy Award-winning report on “20/20” about rear-mounted fuel tanks. In the early 1980s, automobile manufacturers moved the fuel tank to a safer location forward of the rear axle. An Indiana family's 1973 Ford Pinto was struck from behind, and the rear-mounted fuel tank ruptured and burst into flames. An expert witness in State of Indiana v. Ford Motor Company, Byron Bloch showed the prosecution team a safer fuel tank location forward of the car's rear axle. Bloch has studied the problem of truck underride --automobiles sheared while rolling under commercial vehicles. Since the 1960s, he has advocated improved guards on the rear of trucks and tractor-trailers and the addition of side guards. In 1998, congressional action led to federal safety standards requiring larger, stronger rear guards on new trailers. Structurally lightweight automobile roofs that collapse during rollover accidents are also among Bloch's concerns. His testimony to the U. S. Department of Transportation called for roofs capable of supporting four times the vehicle's weight. In 2009, the federal government mandated automobile roofs capable of supporting three times the vehicle's weight, double the previous requirement. Bloch also called for an actual rollover test instead of a hydraulic push test, which only simulates weight and force on the roof. Bloch has advocated the remediation of many other life-threatening structural safety defects, including lack of side impact protection, seat ejection in a collision, tempered glass that crumbles on impact, and lack of safety features on light trucks and vans. 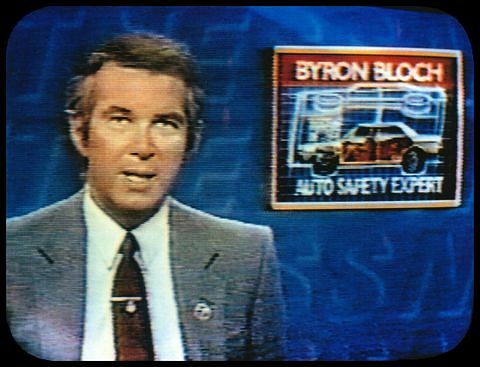 An early advocate of air bags, he prepared television news reports about their lifesaving qualities. 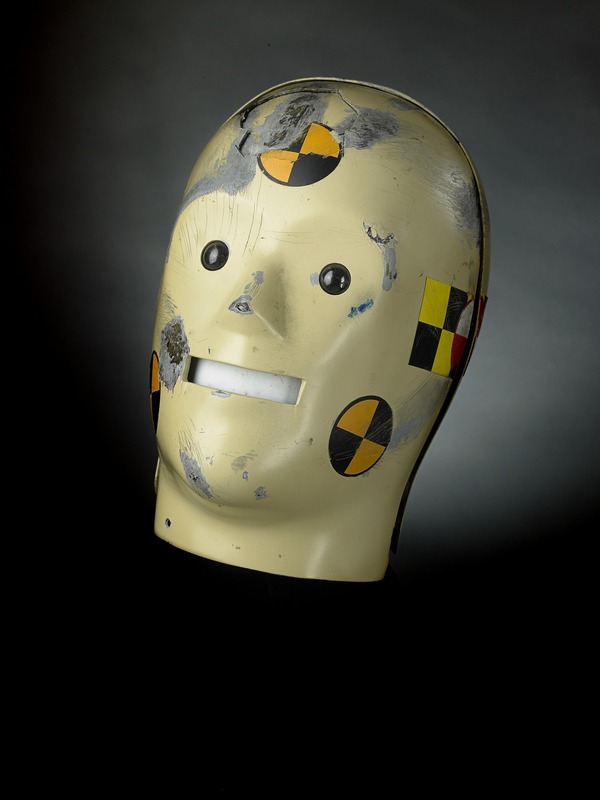 By the late 1960s, independent firms were supplying crash test dummies to automobile manufacturers, who had to prove that they were in compliance with federal seat belt standards. 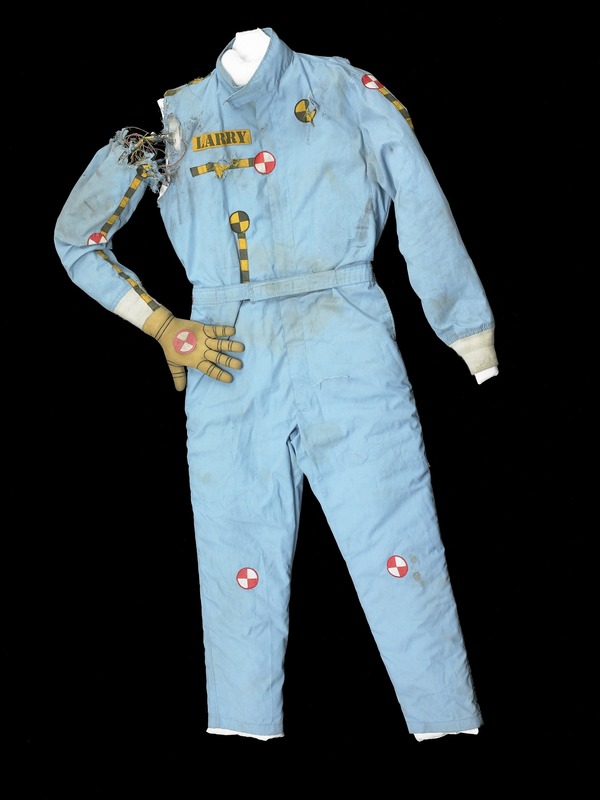 Dummies were fitted with internal sensing devices that measured and recorded impact. 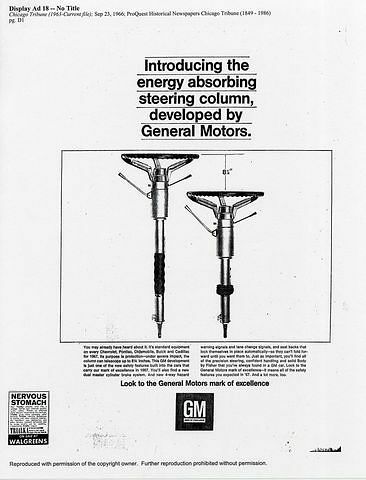 General Motors was not satisfied with dummies placed on the market, and in 1972 GM designed the Hybrid II, so named because it combined the best features of Alderson VIP and Sierra dummies with some original GM component designs. Unlike previous dummies, Hybrid II provided consistent results under similar conditions. Hybrid II also had a human-like slouch, a rubber neck instead of ball-and-socket, and well defined knee-leg action. GM shared its design with competitors and dummy manufacturers. In 1973, the National Highway Traffic Safety Administration certified Hybrid II as the only dummy approved for seat belt compliance testing. 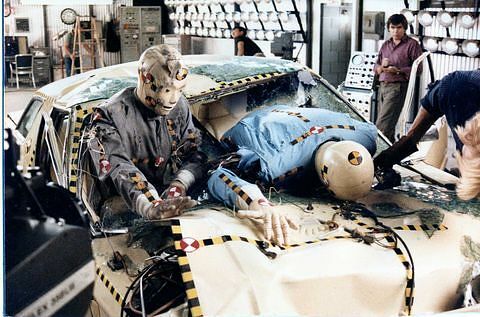 In the 1970s, General Motors began developing the more sophisticated Hybrid III, a sensitive, humanlike dummy that simulated and measured injuries to many parts of the body. Hybrid III had a better defined head, neck, spine, and posture than Hybrid II, and its 41 channels of information (compared to 8 channels in Hybrid II) measured impact to the head, torso, knee, and leg with greater precision. 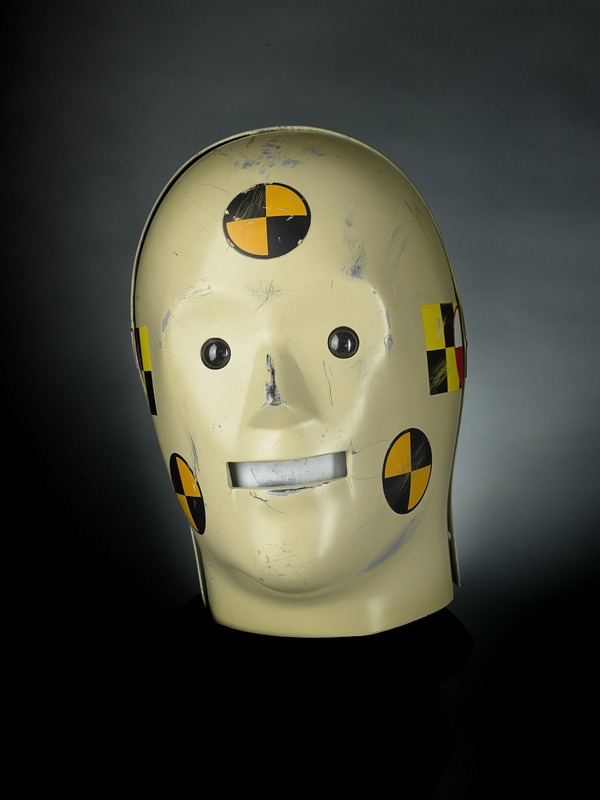 In 1997 the National Highway Traffic Safety Administration recognized Hybrid III as the only dummy to be used for compliance testing. Few motorists wore seat belts when they became standard equipment in 1968. Between the 1970s and 1990s, compliance increased from less than 20 percent to more than 80 percent. Federally-sponsored safety campaigns on television and radio and in print media drove home the message that seat belts and air bags save lives. Between 1984 and 1995, forty-nine states passed laws requiring motorists to buckle up. In 1998, the federal government won a 30-year quest to require air bags in new cars, reflecting a philosophy that safety technology should be the first line of defense in an accident. 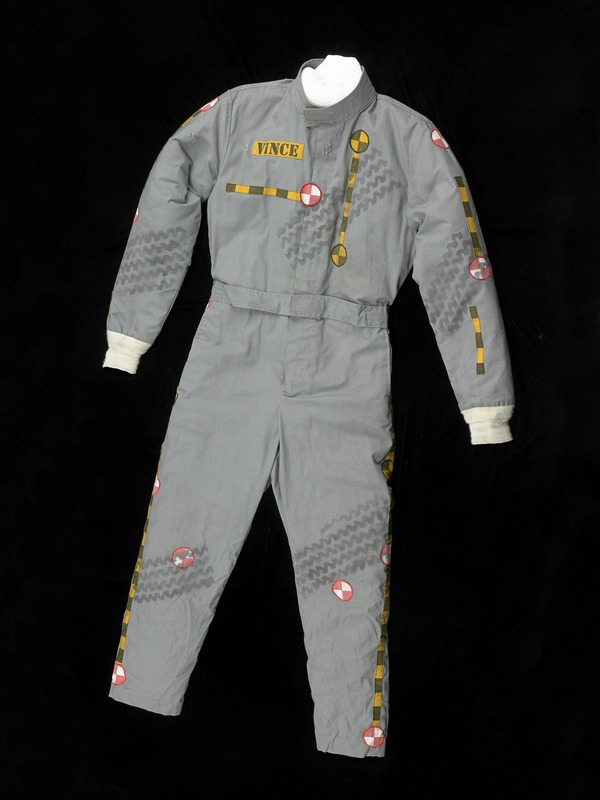 By the 1990s, acceptance of automotive safety equipment had become a social norm. Motorists became convinced that buckling up could save their lives in an accident instead of trapping them in the wreckage. Manufacturers no longer feared that safety equipment made cars appear dangerous or hurt sales. Safety devices became desirable because consumers believed in their lifesaving virtues. Seat belt design had to change in order to be acceptable to motorists and safety experts. A lap belt alone did not secure the upper body. Several full-body seat belt designs were patented in the 1950s, and one emerged as the simplest yet most effective design. In 1958, Nils Bohlin, Volvo’s chief safety engineer, introduced a three-point seat belt that provided lap and shoulder restraints with one smooth motion of the arm. It held the upper and lower body while placing pressure on the chest and hips; a lap belt placed pressure on the abdomen, where internal injuries could occur. The Bohlin seat belt became standard equipment on selected 1959 Volvo models and soon was applied to other Volvo models. 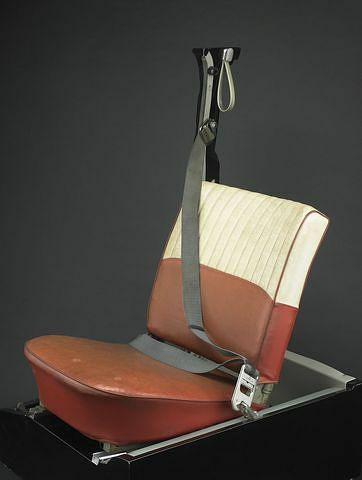 The National Highway Traffic Safety Administration (NHTSA) mandated the installation of front-seat lap and shoulder belts in all cars beginning in 1968, but no particular design was specified. Some car makers installed lap belts and separate shoulder belts. In 1974, NHTSA mandated the three-point seat belt as standard equipment for the driver and front-seat passenger. Later, three-point seat belts also were required in the back seat. In modern crash testing by automobile manufacturers and the insurance industry, the advantages of the three-point seat belt have been confirmed. Its design has not changed since 1959 except for spring-loaded, locking belt retractors, which improved performance and convenience. The National Highway Traffic Safety Administration chose air bag technology as the centerpiece of passive restraints -- safety devices that save the lives of motorists without their voluntary participation. John W. Hetrick patented an air bag operated by compressed air in 1953, and Ford, General Motors, and Eaton, Yale and Towne developed faster gas-fired air bags in the 1960s. But the road from idea to implementation was strewn with technical glitches, motorist indifference, manufacturer skepticism, and changing government policies. Mandatory air bag standards were approved and rescinded several times in the 1970s and 1980s. Meanwhile, General Motors and Ford voluntarily introduced optional air bags in 1974 and 1986 respectively. In 1988, Chrysler became the first American auto manufacturer to install standard driver-side air bags. By 1998, federal law required dual front air bags in all new cars. A series of fatalities caused by air bags made motorists anxious, but by the early 21st century motorists were comfortable with the protection that air bags provided. Few motorists buckled up in the 1960s and 1970s. The National Highway Traffic Safety Administration (NHTSA) decided to use advertising to promote seat belt use. 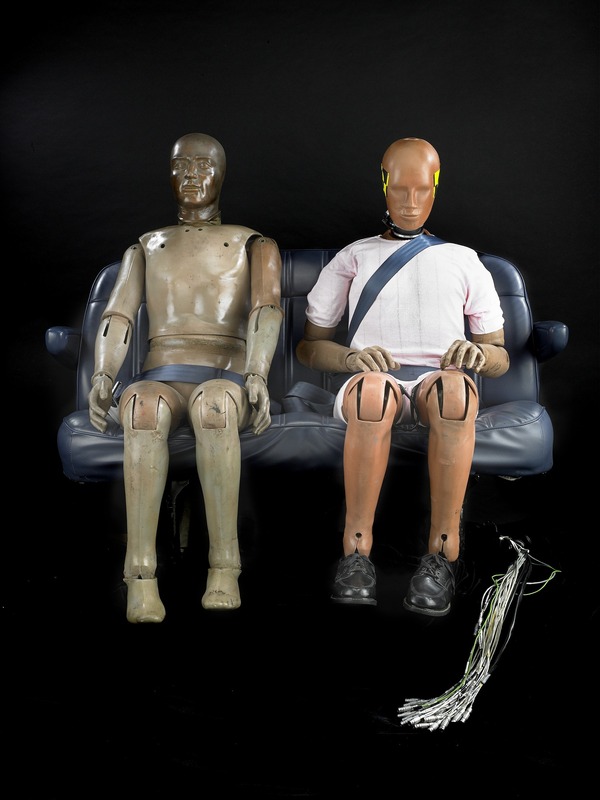 From 1985 to 1998, NHTSA and the Ad Council sponsored television and radio commercials with actors who portrayed Vince and Larry, human-like crash test dummies. Created by ad agency Leo Burnett and professionals in filmmaking, costumes, and special effects, the fast-paced television commercials used humor and negative example to demonstrate the consequences of not wearing seat belts. Actors portrayed the kinetic misadventures of Vince, an experienced crash dummy, and Larry, a relative newcomer. The persistent, thought-provoking theme was that only dummies neglect to wear seat belts. The harsh consequences of this choice were played out in slapstick and mechanical ballet that could be funny and shocking at the same time.